Ah, the challenges of assembling a meal. Particularly vegetarian meals, because often there’s no focal point, but instead an amalgamation of various sides seeking harmony. Today I offer you a combination: three elements that are quite tasty alone, but perhaps not spectacular, yet together create a marvelous dinner. Socca (also known as farinata, is a vegetarian staple I’ve been meaning to make for a while, and I would’ve done it much sooner had I realized quite how easy it is. Chickpea flour, water, a little oil, some time, and heat—very little labor. And so, so delicious. Would your grandmother call this food? Either way, it’s definitely worth eating. Other side note shareables: tips for container garden growing! Also, farmers are starting to use microbes (yep, the same organisms that are receiving accolades in the yogurt-kombucha-aged cheese-loving world) instead of pesticides! Keep working while we attempt to figure you out, nature. The Creation of this meal Story: I had been thinking about socca, and then I got some beautiful purple and red radishes in my CSA this week, along with some mint, and figured radish salad would be a lovely fresh addition. I could be happy with that combination for myself, but I like to fill out the plate a little more when there are other people around (and also, leftovers). The little gray cells landed on lentils: easy, a flavorful accompaniment, but generally not terribly exciting as a main course. Here, they perform their role more than admirably, providing heft and spice and heartening out the other two dishes. As for the salad, the lemon on the radishes cuts their sharpness enough to enjoy a plateful, and the mint wonderfully brightens the warmth of the lentils when ensemble. All scooped up with aromatic socca, I was quite pleased, and I think you will be too. Socca recipe from Mark Bittman, the rest I just threw together. If you have time to mix the batter for the socca ahead of time, do so. Put chickpea flour, salt, and pepper in a bowl, then add water slowly, whisking to avoid lumps. When smooth, add a couple tablespoons of olive oil and whisk again. While that is sitting, cook the lentils: heat up dry spices until aromatic, then add oil and onions and cook until onions are soft. add lentils and stir until the lentils take on some color, but don’t let them burn—have water on hand. Add water, bring to a boil, then simmer until soft, around 20 minutes (red lentils disintegrate fairly quickly). When ready to cook the socca, put a large cast iron pan in the oven and preheat to 450ºF. When hot, remove pan and add a little oil and some rosemary (you could also cook a few onions at this point, returning the pan to the oven until onions are brown, then adding them to the batter). Pour batter into hot pan (don’t forget oven mitts at any point in this process!) and cook for 10 or so minutes, until golden brown and set (actual length depends on how wide your pan is, which determines the thickness of the pancake; I admittedly burned mine a tad). While the socca is cooking, wash and cut the radishes into quarters, or bite-size chunks depending on their size. Chop up mint and place both in a bowl. Squeeze the lemon (including pulp) over the radishes, add a little salt and pepper, toss, and taste. Adjust as needed. Serve, and don’t worry if lemon juice from the radishes (it may even turn pink!) seeps into the lentils. Do try to avoid making the socca soggy though. Mm, ramps. Ramps were what Rapunzel‘s mother was craving from the witch’s garden that started the whole curse/giving away the child problem. They are garlicky and oniony, and mostly only grow in the wild, to be foraged. Fortunately, my new roommate (!) has a source and collected a bunch for us to enjoy. I also realize that this blog has thus far been bereft of actual fish, which is a real shame, given that it’s based in Maine (I did do a scallop rendition, but they are distinctly not fish). 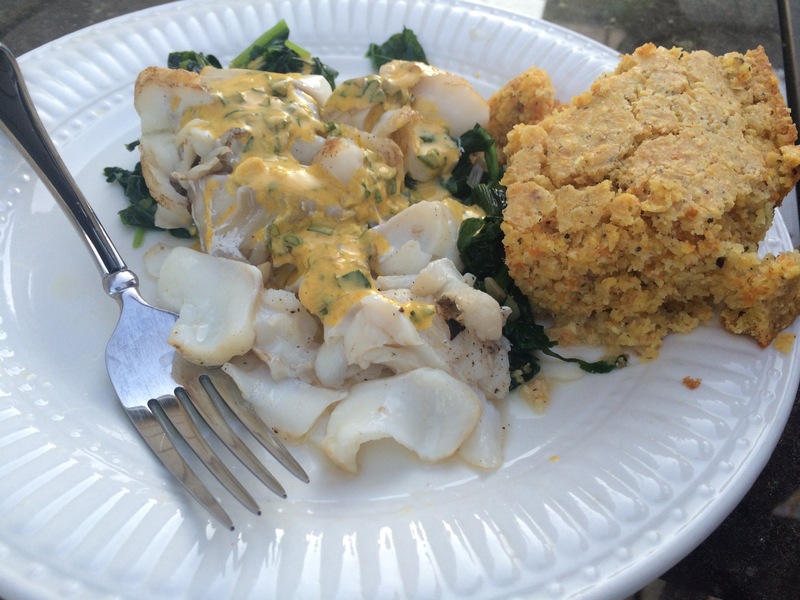 The fish I used here was haddock, which is a fairly generic white fish. I’m admittedly not even sure I would be able to tell the difference between white fishes—I don’t eat a lot of them so maybe that’s why—but still, it seems odd that some are much more expensive. The vagaries of the fishing industry for you. The haddock was from Port Clyde Fresh Catch, where you can place an order for fish caught that week, and get it delivered to your local store (assuming you are on their route). Community Supported Fisheries! There was a big to-do over global fisheries a little while ago, and the fact that slaves may be catching a lot of our US fish. Surprised? On the other hand, Maine’s aquaculture industry seems to be growing, and we know where that comes from! I enjoyed it with cornbread, out on the deck (lots of butter, cornmeal from Fiddler’s Green, Misty Brook Farm, and Songbird Farm, and just a touch of flour; I’ll tell you details sometime). The sauce/dressing is important, don’t skimp. Sauce is really all it takes for a meal to go from ho-hum to amazing—it’s good to have a few standbys (such as yogurt dressing). Rub salt and pepper in the fish and set aside (this all happens very quickly. If you want to use two pans, you could; I just made the ramps and spinach first and kept them warm on the side). Loosely chop the ramps (save a few for the dressing) and add them to a hot pan with a little oil. Sauté briefly, then add spinach (chop spinach a bit if you like). Salt and pepper, just a little. Remove when spinach is barely wilted, and keep warm on the side. Heat up the pan again with a little oil, and add the fish when quite hot. After a minute or two, flip it over and add a little white wine. Cook just until it starts flaking apart, only another few minutes (overcooked fish is the worst, don’t do it). While the fish is cooking, mince the remaining ramps. Stir them with yogurt, lemon/lime juice, and turmeric. Taste, adjust, and salt and pepper as necessary. Place sautéd ramps/spinach on a plate, top with fish, and drizzle/pour the sauce on top. Garnish with a little extra ground pepper, and a few more minced ramps.